There’s a new kind of liquor store opening in the Strip District, a first of its kind in the state of PA. The mission? To get people excited about locally made spirits and wines–made easy by the fact that you can sample everything right in the shop. 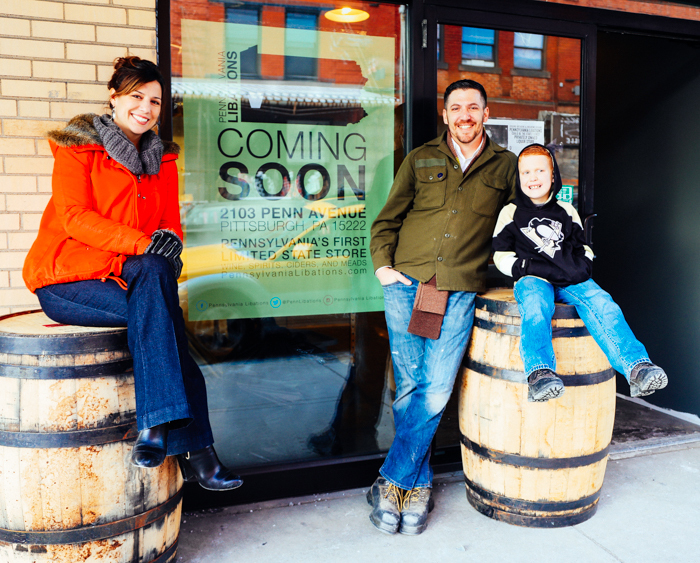 Pennsylvania Libations, a company devoted to locally produced liquor and wine is opening their retail storefront on Penn Avenue and 21st Street. The store, privately owned by Christian Simmons, should open by early March. Customers will be able to shop from more than 31 different “made in PA” manufacturers, including rum, vodka and wine, and taste products before buying. 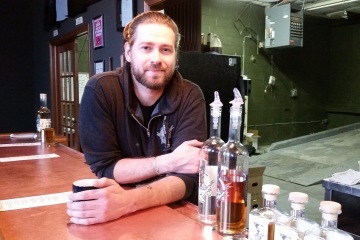 In addition to connecting consumers with local brands from all over the state, Pennsylvania Libations aims to be a hub of inspiration for bar and restaurant owners looking to revamp their cocktail programs with craft spirits. They will provide consultation with businesses looking to incorporate more local spirits and wine, and will work with event planners to customize drink menus with unique Pennsylvania-made products. Mixologists and sommeliers working at the shop will also be available for private events. Faith George, Christian Simmons and son Roman of Pennsylvania Libations. Photo by Tom O’Connor. “One of the highlights is you can try everything,” notes Simmons who says that the concept was made possible by significant changes to the state’s liquor regulations passed last summer. 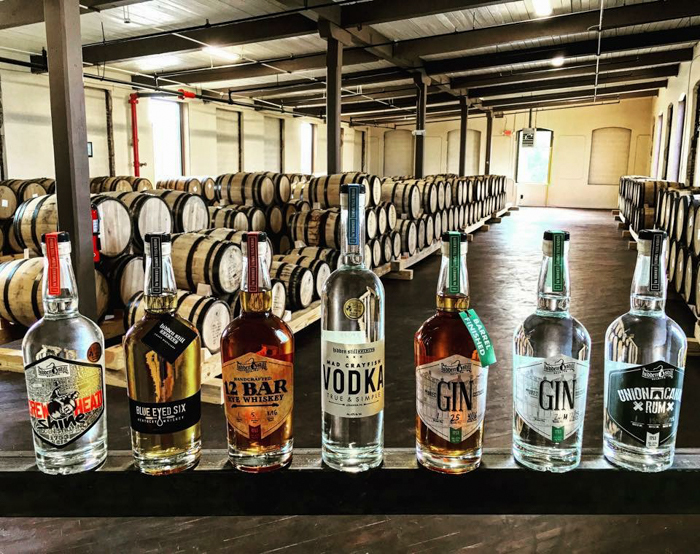 The store puts the spotlight on small batch, local producers hoping to gain exposure and build brand equity–and most of the products at Pennsylvania Libations will not be available in the state stores. The success of local distilleries like Wigle and Maggie’s Farm Rum in raising their brand profiles has given other small producers in the state reason to be optimistic. Local brands featured at Pennsylvania Libations shop. The store has already lined up products from 22 distilleries with the rest of its inventory coming from local wine (including Pittsburgh Winery), cider and mead makers. Mead, a honey-based wine which is growing in popularity, will be featured with different flavors and alcohol levels. Simmons, who co-founded Four Seasons Brewery in Latrobe and later began working as a broker for many of the state’s independent brands, has already built strong relationships in the city with bar managers and restaurants. He knows firsthand the time demands put on producers just to keep their operations going. “There’s never enough time to get out there and sell,” says Simmons. “I want to be an industry leader and help these small businesses who are looking purely for representation,” he adds. Simmons is the sole owner of the company that handles sales, marketing and distribution for a portfolio of local maker clients. His goal for the store is to enlighten consumers about new quality craft products the state is producing. “When a customer comes in looking for something like Tito’s vodka which they are familiar with, we’ll be able to teach them about different local alternatives made from locally sourced grains and give them a chance to learn about and try something new,” says Simmons. A strong selling point is that sales support small local businesses and keep funds in the state. 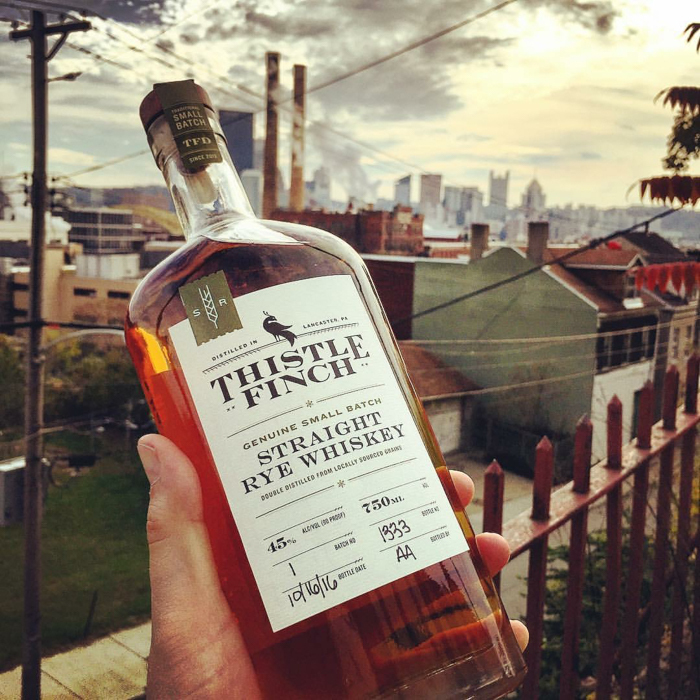 Local makers Thistle Finch will be one of the craft distilleries featured in the shop. 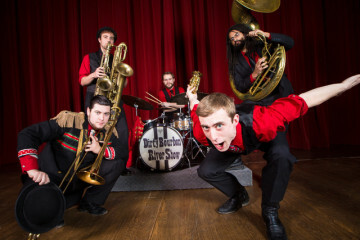 Photo by Pennsylvania Libations. The explosive interest in craft breweries is helping to energize local distilleries and wine makers. 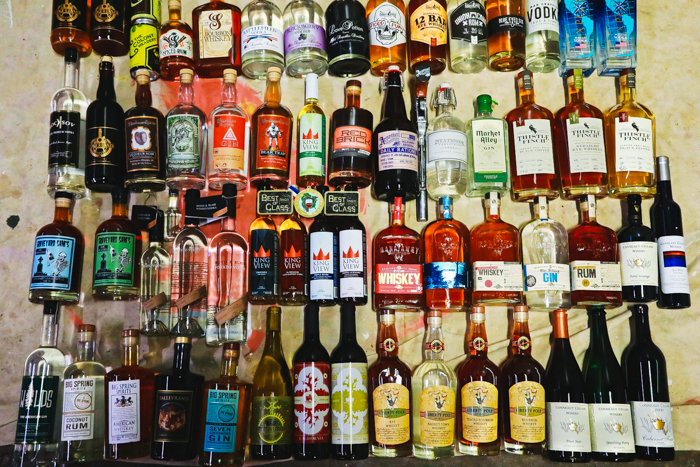 Many are hoping for similar growth for small-batch liquor and wine products. These smaller, independent makers are usually licensed as “limited distilleries” or “limited wineries” by the state. According to the Pennsylvania Liquor Control Board (PLCB), applications for both types of licenses continue to be on the rise. “One of the best things about being in the craft spirits business is that there are new products coming out all the time so we will always have a rotation,” says Simmons. The store will also feature some limited release products not available anywhere else. The store hopes to benefit from busy foot traffic in its Penn Avenue location, next to Mon Ami. Simmons is hoping the store will become a new Strip District destination for those looking for more things to do on their trips to the area. The store has quickly become a family operation with many relatives pitching in to help with the buildout and interior construction. Simmons’ sister, Faith George, will be serving as Director of Operations when the store is up and running. His young son, Roman, who has been a steady fixture during the renovation of the space, has his own role in keeping “spirits” up by making sure the “happiness level” for everyone working at the store remains constant.